DH and I recently met @nanigurl and @wehearthawaii for dinner at V-Lounge. 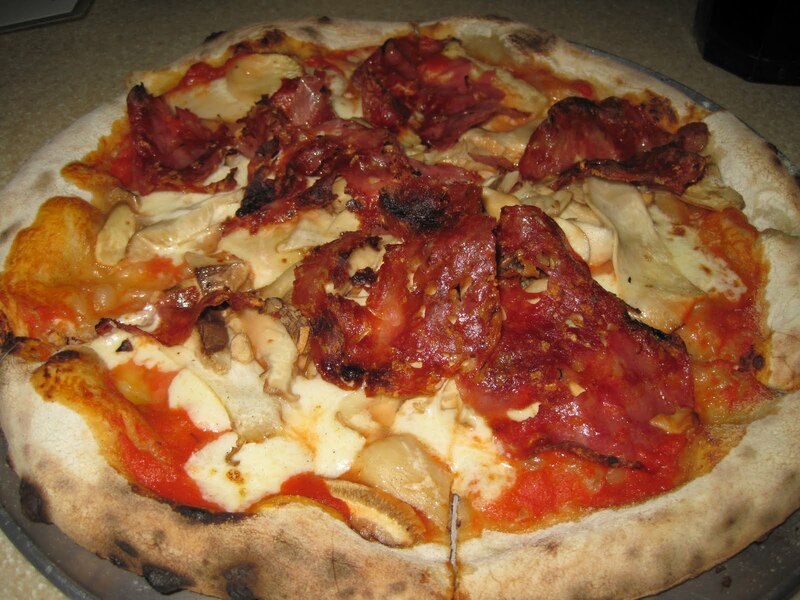 Before heading there, I read several reviews online, most of which raved about the kiawe wood- fired pizzas, but there were also a lot of negative comments about the service and atmosphere, all of which I discovered to be pretty accurate. When we got there, the first thing I immediately noticed was how noisy it was. There were about 10 or so people at a table in the middle of the restaurant and they were quite loud; music was blaring; and several TVs were on. One of the NBA Finals game had just finished that evening, so I'm not sure if it was just a coincidence that the place was noisy or if it's always like that. By the time DH and I got there, @nanigurl and @wehearthawaii had already ordered pizzas. @wehearthawaii ordered a Build Your Own Pizza with Hamakua Ali`i Mushrooms and Sopressatta. I normally don't eat meat, but it looked really good and had to try it. It turned out to be my favorite of the pizzas we ordered. 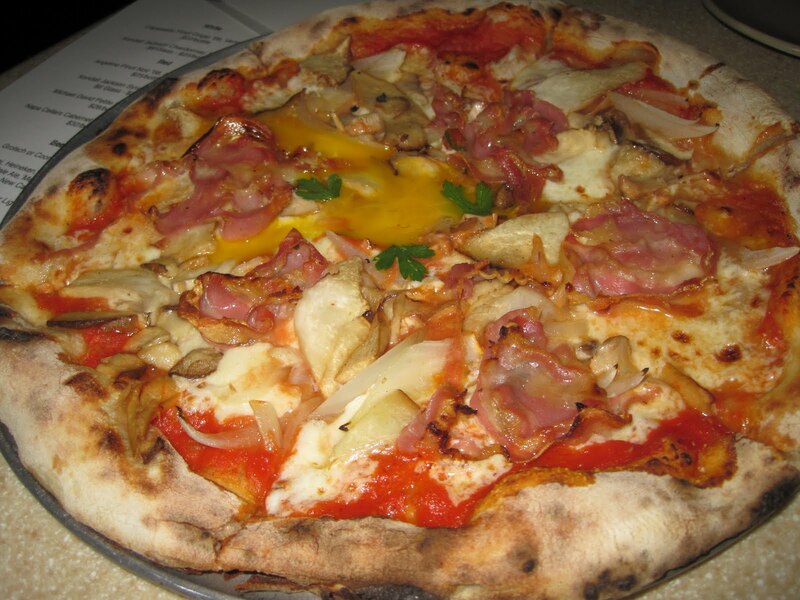 The pizza was topped with a bunch of ingredients, including onions, mushrooms, pancetta, cheese, and herbs, and it's finished with a raw egg. I did not want to try it because of the raw egg, but everyone else ate it up. 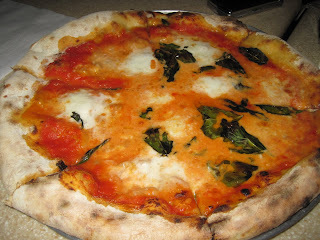 I ordered the Margherita--simply tomato sauce, mozzarella cheese, and basil. It was a pretty basic pizza, and I thought it was pretty good. DH wanted to try the Salsiccia, which is topped with Kukui Brand Italian Sausage, ricotta cheese, onions, and chili flakes. I didn't try it because I don't care for sausage. @nanigurl took one bite and said it was too spicy for her. 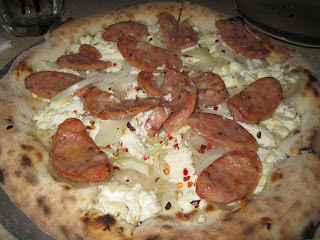 DH actually liked this pizza the best of all. As far as the food goes--I thought it was pretty good. I loved how everything is made fresh and that the restaurant really supports local farmers. The pizza crust was a lot thinner and chewier than I would have preferred, but I thought overall the pizzas that I tried were good. However, the service was not the greatest. At one point, I had a menu on the table, but my arm was on it, and the server just yanked it out from under my arm, without even saying "excuse me" or asking me for the menu. And after we asked for the remaining pizza slices to be wrapped up, another server came and took all of our waters away without even asking us if we were done. My daughters gave us 2 gift cards to CPK, which is probably better than V. I love their Chinese Chicken Salad and Shrimp Scampi Pizza.